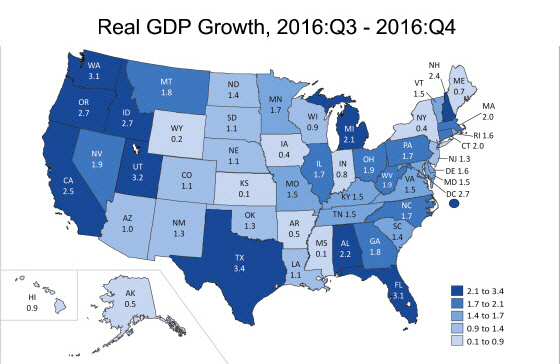 New data on state-level GDP was published this morning by the Bureau of Economic Analysis. 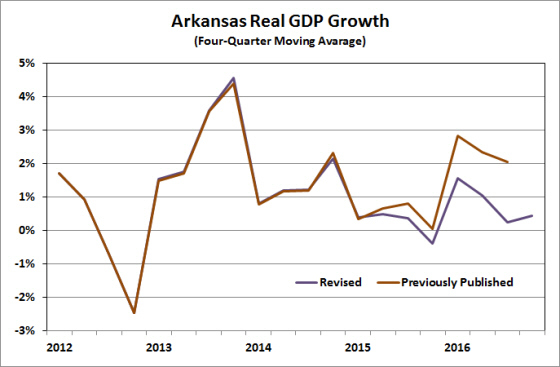 In the fourth quarter, Arkansas GDP expanded at an annual rate of 0.5%, well below the nationwide average of 1.9%. Arkansas growth rate ranked #45 of the 50 states. First-published estimates of GDP are based on incomplete data and are subject to significant future revision as more information becomes available, so the relatively low growth rate in the second quarter should not necessarily be cause for alarm. However, today’s release also included revisions to data for 2013 to-date. For Arkansas the revisions were negative and substantial: The cumulative revision to the level of real GDP in 2016:Q3 amounted to 2.1%. The newly revised data show recent growth rates of GDP to be in the range of less than 1%, compared to the 2%-3% range indicated by previously published data for 2016. Today’s report also represents the first estimate of the state’s GDP for 2016 as a whole. 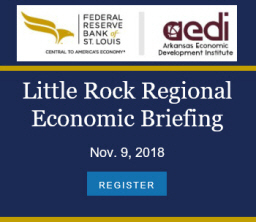 On an annual basis, the growth rate for Arkansas’ GDP was 0.8%, compared to 1.5% for the U.S. Arkansas’ growth rate has fallen short of U.S. growth since 2013, with the gap particularly wide in 2015 (0.2% vs. 2.6%). 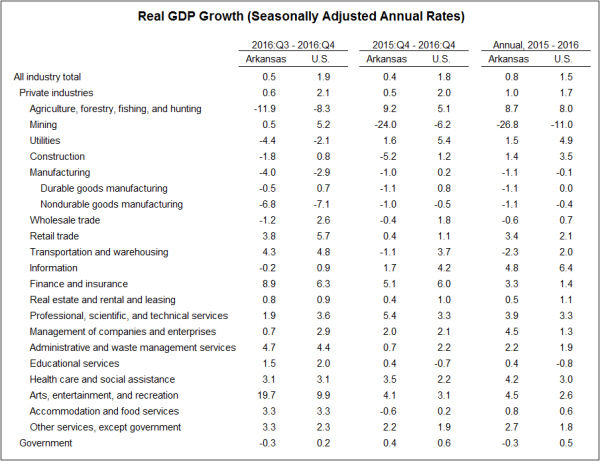 The table below details growth by sector for Arkansas and the U.S. 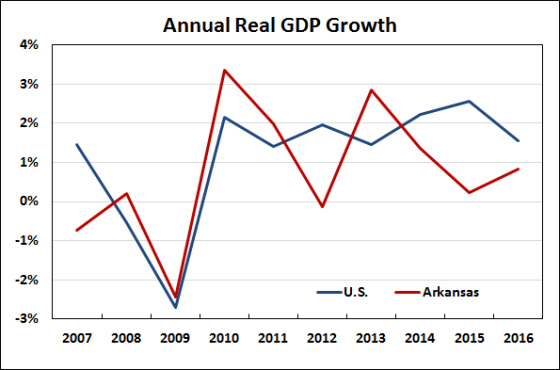 The relative weakness of Arkansas’ growth is clearly concentrated in goods-producing sectors. Low energy prices have depressed mining activity both nationwide and in Arkansas. Durable goods manufacturing growth has been positive nationwide, but manufacturing growth for both durables and nondurables has been negative here in Arkansas. Construction activity has also been relatively weak in Arkansas. Service providing sectors in Arkansas have performed better, in both absolute and relative terms. Although the one-quarter growth rates in Arkansas for 2016:Q4 are generally below national averages, year-over-year measures of service sector growth compare more favorably to national growth rates.